This dish is very simple but surprisingly tasty. 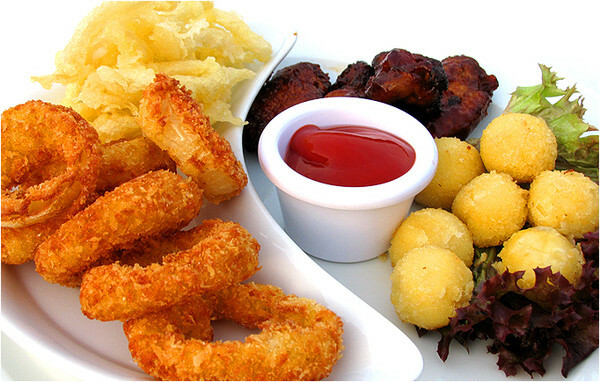 Appetizer of crispy rings will not stay on the table, and will just disappear instantly. The ingredients for the meals are available to all. Washed pre-beat eggs in a bowl, add the milk. Of egg milk weight slightly beat with whisk, lightly salt. Take another bowl and in it pour the flour, baking powder, salt, paprika, mix well. Squid thawed at room temperature, thoroughly washed, remove them from the foil, then cut into rings. If there are ready-made ring, you can immediately use them. To prepare the sauce. This is laid out in a bowl the yogurt, he squeezed the juice of half a lime, added Worcestershire sauce, Tabasco, all salted and sprinkled with pepper, then thoroughly mixed. If someone loves hot sauce, you can add chili powder. Cilantro finely chop and add to the sauce. Dip squid rings in egg mixture, shake off excess and roll in flour. Breaded in this way the rings are laid out on a Board about 10 pieces. On medium heat in the pan very well to heat the oil. Fry can be started when oil begins to slightly POWERCIAT. Oil should be enough to ring it floated. The rings are immersed in oil. As the top of the rings still POPs up, you will need to flip after 30 seconds, then another 10 seconds to fry. To prepare a plate with paper napkins or towels to remove excess oil. Ready fried rings to catch and put on plate. Then immediately begin to fry the second batch. Ring is ready to serve with sauce.